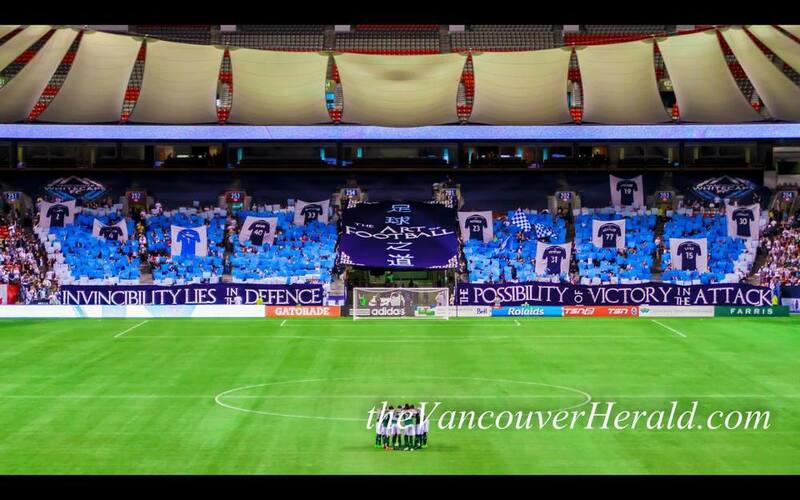 Displayed prior to our first home match against Seattle in 2017, a Stranger Things inspired tifo with the words “Cascadia Kings” on top of an outline of BC Place, reminding everyone that we still have the most Cascadia Cup victories. When the fixture list was announced, and we saw that Tigres UANL, defending Liga MX Champs at the time, were next up for the Caps, it was going to be a tall task. After a 2-0 loss in Monterrey, the odds were even worse. Steadfastly, our partners continued to believe. We decided to go all Star Wars with this display, using an image of Han Solo, Leia and R2-D2 with the phrase “Never Tell Us the Odds” as spoken by Han during Episode V: The Empire Strikes Back after C-3PO shared the odds of successfully navigating an asteroid field in the Falcon. Unfortunately, our beloved Caps were unable to complete the comeback. Photos courtesy of our own photographer, Jay Mayede. 2017 started off earlier than it normally would, with a CONCACAF Champions League Quarter-Final 2 legged tie against fellow MLS side New York Red Bulls, with the 2nd and decisive leg at home. We are not pleased with the fact that Red Bull is allowed to have in-stadium advertising on addition to owning a franchise. This was our way of showing our feelings towards both the visiting team and our own for front office for allowing Red Bull to have signage in our stadium. The shirts were provided by one of our partners. 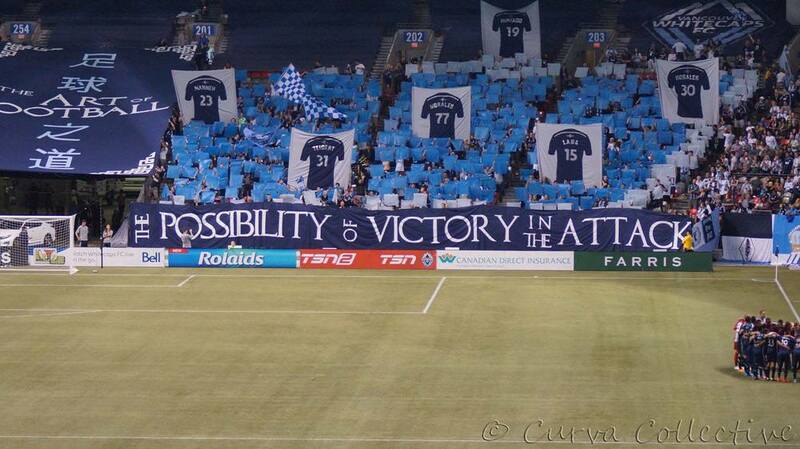 This 2 part display was presented ahead of our Champions League fixture against Sporting Kansas City. Known for their BBQ and this being the 3rd incarnation of the team, we thought we’d have a little fun. With the fixture being played on a Tuesday, it seemed to be a natural fit. During his time in Vancouver, David Ousted was always one to be vocal on the pitch. His intensity, win or lose, was evident. Some loved it, some not so much. We thought it would be appropriate to try and capture that and re-create that prior to a match. June 2016 marked the first visit of the NASL Ottawa Fury, and their assistant coach, former Whitecap and Canadian Men's National Team player Martin Nash. Much like previous club legends, we recognized him the same style that we did for Valentine and DeMerit. Photos courtesy of Jay Mayede. March 2016 was a momentous time for the movement. We finally got serious about merchandise, well, sort of. This marked the release of our partner (or members) scarf, which is only available to the partners of the movement. In addition we also released a Voyageurs Cup scarf and shirt. Here we have each side of the scarf displayed and sandwiched between them would be a number of our partners holding up the backside of the scarf. This was a momentous evening for the MLS era Caps. Their first ever home playoff match, against Cascadian rivals, the Portland Timbers. A massive flag mosaic shows the flags of all the countries represented by players on the Caps roster framed by the flag of British Columbia and Vancouver. Together We Will Do This was the simple word banner. Unfortunately, our boys were unable to overcome an early injury and eventually fell. A joint effort between us and our friends from Rain City Brigade. The word banners utilized the round logos of each group doubling as the letter “O” for each word banner. The middle peace featured two supporters holding the Cascadia Cup. During the production of this display, former Captain Jay DeMerit joined us to do a little painting. 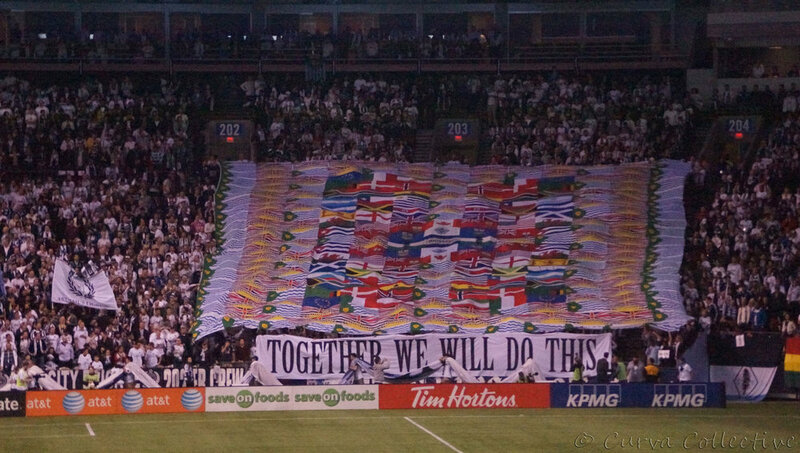 This was a pre-match display prior to the Sounders home match in 2015. Our boys fell short in their attempt to retain the Cascadia Cup. 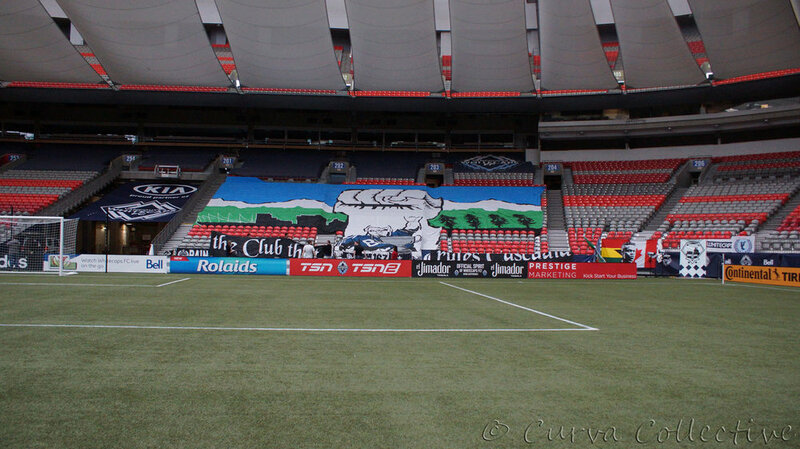 Prior to the 2nd leg of the Voyageurs Cup, we teamed up with the Vancouver Southsiders to present this large Vancouver flag display along with two large word banners. Even though it’s less complex than other joint displays we’ve done, it still requires a massive amount of manpower and coordination to pull off something this large. 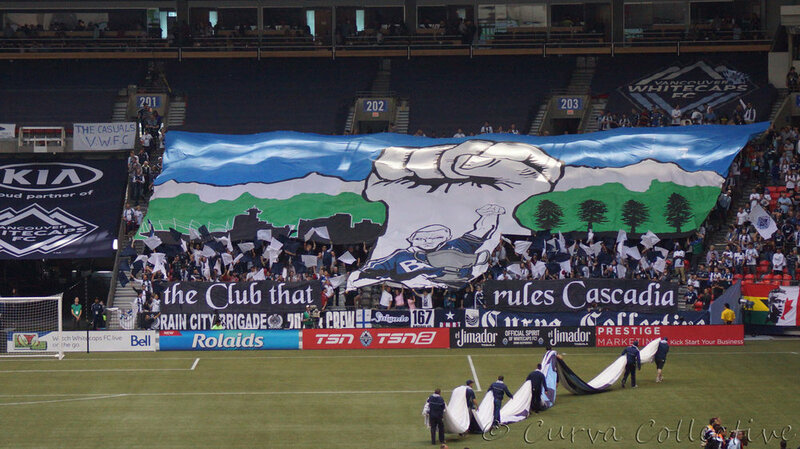 The first banner, held up by our friends, the Southsiders, is the Vancouver city motto: By Land Sea and Air, We Prosper. Many thanks to everyone involved in the creation and deployment of this banner. Photos courtesy of Jay Mayede, our own photographer. Fuerza Charrúa is a reference to the strength of the indigenous peoples of Uruguay. This simple, but effective display was unveiled in conjunction with our 2nd t-shirt to open the 2015 season. The first part of this display were word banners from previous displays that we had done. Around our logo were just simple flags with word banners above and below. “Words Are Powerful” was displayed above, while “When Spoken with One Voice” was displayed below the logo. Jay Demerit was announced as the the first MLS signing for the Vancouver Whitecaps back in 2010 and was named Captain. 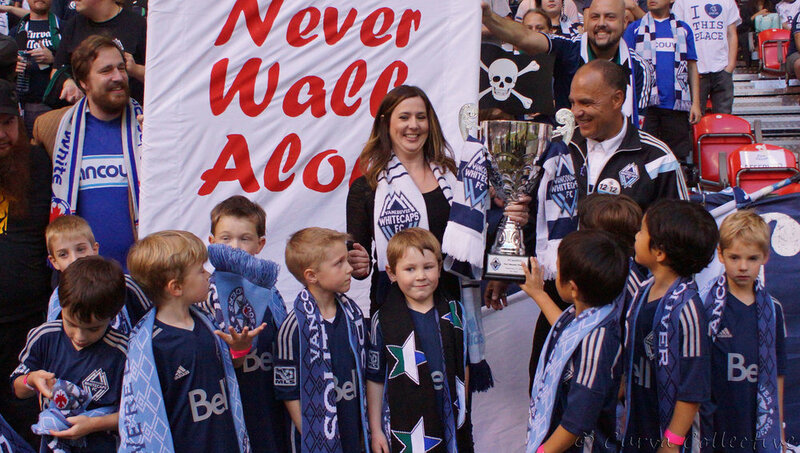 He gave his heart and soul to the team in his 3.5 seasons in Vancouver and acts as am Ambassador for the Club. During the 2014 season, he announced his retirement from professional football and was announced that at the final home match of the season would be a tribute to Jay and his career. Prior to kickoff, we displayed a 4 piece display as a tribute to his career. The main piece featured a sketch of his upper body with the words “CAPTAIN DEMERIT” on it. The other three pieces teams he had played for, Watford FC, Whitecaps FC and USMNT with the words ROSE, LED, SHINE above each of the team logos. Ahead of the Caps only clash in Seattle in 2014, we joined forces with the Vancouver Southsiders to send a message, not only to our players, but to everyone in stadium. We were not content with just four Cascadia Cups. Thanks to the handful of people that worked on the creation, the dozen or so that worked on the in-stadium setup, and all the #CapsOnTour that were a part of deploying it. 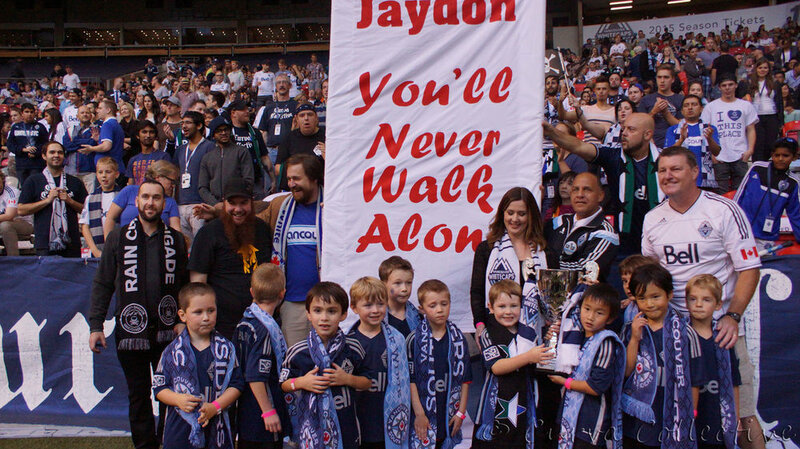 The execution wasn't perfect, but the message was meaningful and ultimately we hoisted our 5th Cascadia Cup. We completed the #DriveForFive. We are the #FirstToFive. We are the Cascadia Cup record holders. We know who we are…#KingsOfCa5cadia!!! Make A Wish BC teamed up with Whitecaps FC to treat Jaydon and his Port Moody Pirates U7 team to a day they will never forget. They were notified of this special day by a surprise appearance by Spike, Christian Dean and Marius Rovde at the training session a few days before. Thanks to Jay Mayede for capturing these moments for us. On September 10, we joined in with everyone that is a part of our Club in honouring Carl Valentine. He was a great player that helped our Club claim many a title. We are also greatly appreciate the roll he currently plays as an Ambassador and as a coach for our U16 Residency side. These opportunities allow Carl to pass on his love for football and our Club. Carl, thanks for being you. Thanks for your support of our movement and the entire Club. We hope that Wednesday evening was a meaningful occasion for you and your family! Here are some photos of the display we did and of Carl's visit to 203/204. 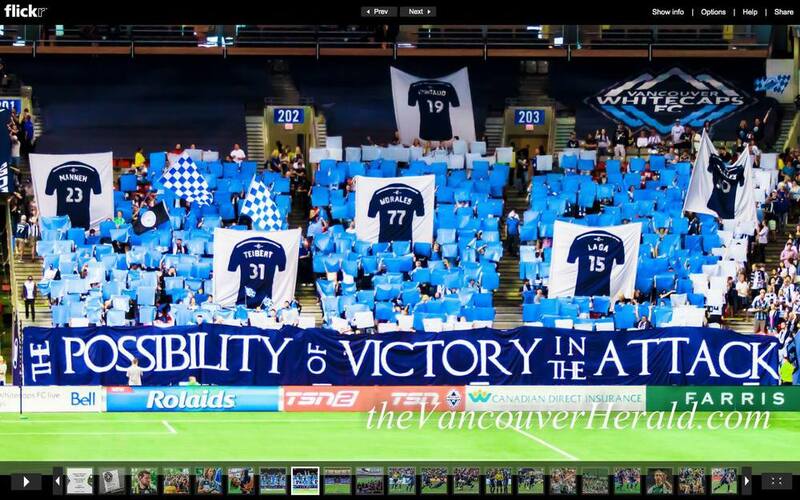 Thanks to Jay Mayede for capturing all of these moments…except the side shot of the display, which came from Whitecaps Scarf @Caps_Scarf on twitter…and one by Tom from Residual Image (working for AFTN Canada). As you can see, any display of this magnitude is a massive undertaking. It all starts with an idea. Sun Tzu's The Art Of War was thrown out as a potential theme. 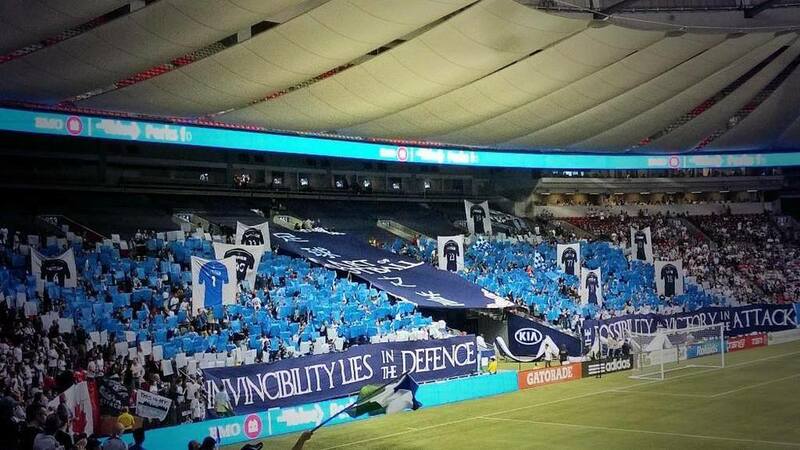 As the display began to take shape, it was decided that instead of doing it just on our half of the tunnel in BC Place's west curva, we should partner with our friends in the Vancouver Southsiders (VSS) and have the display cover the entire curva. They obliged and work began. It was a long and sometimes quite stressful process as much coordination was required in adddition to meeting deadlines so that the work could be completed. The display it self started with the three sections on either side of the tunnel holding up placards. The word banner on the VSS side was raised, reading "INVINCIBILITY LIES IN THE DEFENCE"…followed by the the raising of large 2-sticks with our starting 'Keeper and back line. Then on our side of the tunnel the word banner reading THE POSSIBILITY OF VICTORY IN THE ATTACK was raised. Followed by our starting midfield and striker. Last but not least the tunnel piece was unveiled with the name of the display…THE ART OF FOOTBALL…in both English and Chinese (thanks to Ricky Pak for verifying this!) . 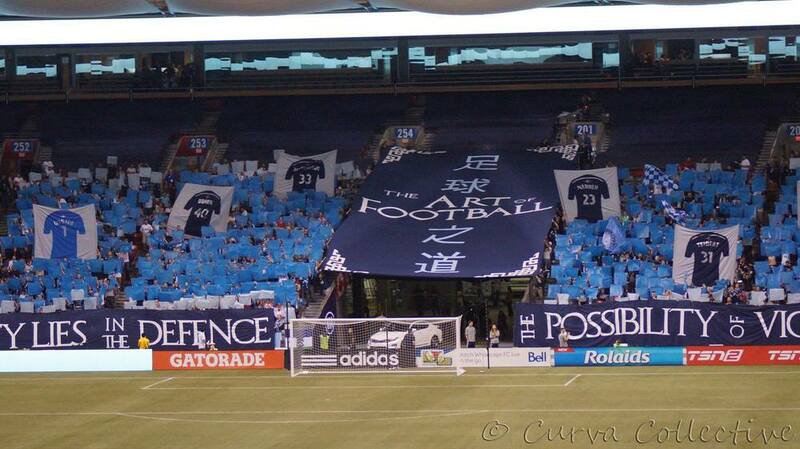 Any time a display of this size is attempted, a massive amount of in-stadium effort is required. 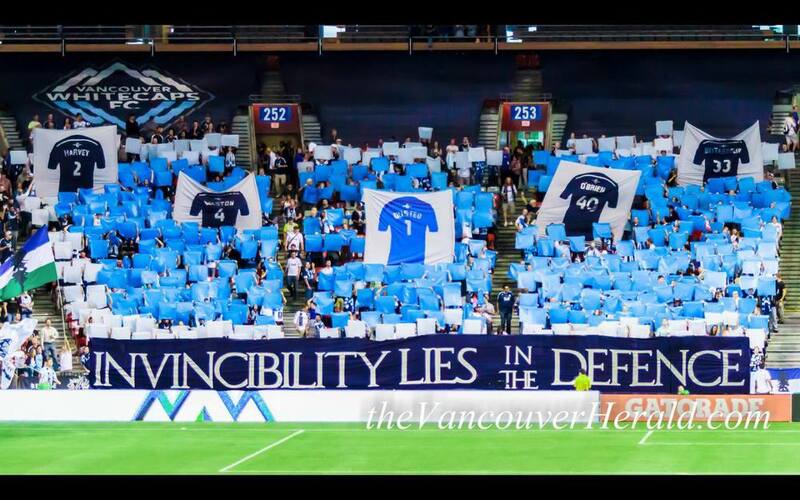 In addition to our own partners who sacrificed their prematch activities, the Southsiders and their crew, we would also like to thank the Rain City Brigade, 202 FB Crew and everyone else in the end who help up a placard or a massive player two stick to ensure this display was a success. May 24, 2014 was a significant day in the Caps MLS history. This marked this first home Cascadia match since capturing their first MLS era Cascadia Cup. We took the opportunity to create a multi-section display to mark the occasion. A large fist, with the Vancouver skyline, 4 Douglas Fir trees and an image of Demerit holding the Cup with one fist in the air. 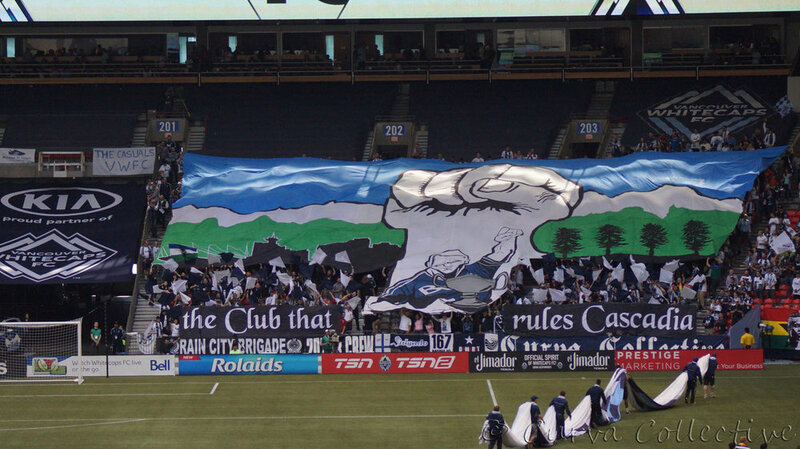 The text was “The Club that Rules Cascadia” with blue and white flags between the word banners and the main piece. Many thanks to all those involved in creation, transportation, testing and deployment of this effort.